Our town, Norwich, Vermont – home to 3,400 hearty souls- has a great many things to recommend it. Chief among them is our superb library, full of well-chosen titles, as well as some interesting, little recognized historical buildings. On March 4th, 2012 these will all be celebrated with a tribute to Dr. Seuss. Yes, Dr. Seuss is uniting books, libraries and historical preservation. But how? You mean you didn’t know? As Dr. Seuss says, “You’ll miss the best things if you have your eyes shut!” So open them up wide and come to Seusstival – a Dr. Seuss read-a-thon combined with a children’s production (kids over age 8 need not apply) of The Lorax– being held on Sunday, March 4 at Tracy Hall. Seussian readers include Norwich’s own Olympic Gold Medalist Hannah Kearney , our town’s volunteer fire fighters, police chief Doug Robinson, and Tracy Smith, art teacher extraordinaire, who will be retiring in June after 25 years of working with our elementary school students. What a special afternoon! From there to here, from here to there, funny things are everywhere! All proceeds from this event will benefit the Norwich Public Library’s Children’s Room (which happens to be housed in a historic building) and two historic one room schoolhouses – the Root District School and the Beaver Meadow Schoolhouse – both of which are in need of some serious renovations. For details visit the event’s Facebook page http://www.facebook.com/seusstival. Historical footnote : Dr. Seuss, aka Theodor Seuss Geisel, attended our neighboring college – Dartmouth – and began his cartooning career there when he edited Jack-O-Lantern, the College’s humor periodical. 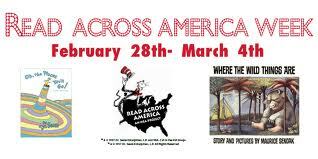 In an effort to salute this meaningful collaboration and to support Read Across America, whose efforts inspired Norwich’s “Seusstival”, The Book Jam has reviewed some Dr. Seuss titles below. A few were new to us but others are perennial favorites. For anyone needing Dr. Seuss tales and also wishing to support Seusstival, the Norwich Bookstore will donate 20% of all Dr. Seuss sales between now and March 4th to Seusstival. Remember, the Norwich Bookstore will ship anywhere in the world. 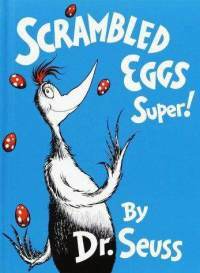 Scrambled Eggs Super by Dr. Seuss (1953) – A local 6-year-old was laughing so hard at the names in this book that he literally fell off the couch while being read aloud to by his mom. Ha, you think not? Well, you try to say -Mop-Noodled Finch, Zummzian Zuks, Ham-ikka-Schnim-ikka-Schnam-ikka Schnopp, or Mt. Struckoo Cockoo – with a straight face. “I dare you to try it, I dare you to your face.” This story about making a batch of scrambled eggs from a bunch of CRAZY bird eggs will have you laughing, too, and wondering why you ever settled for the normal, hen-based kind. With its colorful egg theme, this book would make a great addition to an Easter Basket! 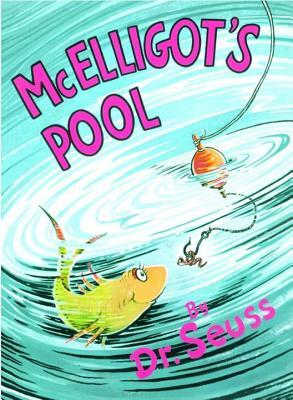 McElligot’s Pool by Dr. Seuss (1947) – The optimists in us love this one. An oldie but goodie Dr. Suessian tale, this one is narrated by a boy sitting above an unlikely fishing hole. He fishes and fishes and firmly believes, not only that he will he catch one, but that he will catch maybe three. And to top that off, he believes that they will all be quite rare and special for him by swimming straight to his lair. It may be a kid day-dreaming and wishing very hard who tells this story but it is an excellent reminder for the middle-aged adult that faith and persistence in face of the odds really can pay off…. and also that it might be time to clean up our fishing holes! Gerald McBoing Boing by Dr. Seuss (1950) – First seen as an academy award-winning cartoon. It is less subtle than most in reminding kids that all people have talent and all kids have worth. Meet Gerald who may not be able to talk but can make the greatest sound effects of all time. With great illustrations and superb silly words to be loved from here to New Perth. 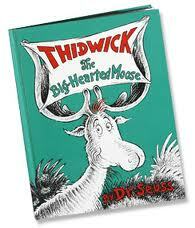 Thidwick The Big Hearted Moose (1948) New to one Lisa but not to the other, Thidwick is a fun, funny story about what happens when you say yes to everything and everyone – including a bobcat, a turtle, four squirrels, a bear and 362 bees. A not-so-subtle poke at Harvard (a collegiate rival of Dr. Seuss’ beloved Dartmouth) is included in this tale about how a generous moose finally saves himself from the demands of his fellow forest creatures – all of whom want to live in his antlers! A timeless message about taking care of yourself and a lovely book for anyone living in the north country, near their own version of “Lake Winna-Bango,” to have on their shelves. The Lorax by Dr. Seuss (1971) – An environmental tale told by the now remorseful Once-ler who, bewitched by the Truffula Tree tufts, greedily chops them down to produce and mass-market Thneeds. As the trees disappear, the Lorax, speaks for the trees “for the trees have no tongues”, and warns them all – but for his words the Once-ler has no needs. A message that never loses its power or importance, read this aloud and inspire the next generation to access its inner Lorax. 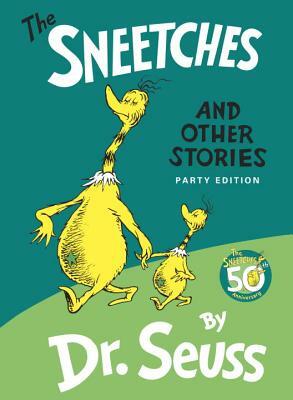 The Sneetches and Other Stories by Dr. Seuss (1961) – A story of haves and have-nots in which access to goodies is determined by whether you have a star on your belly, or not. But then one day, the scheming Sylvester McMonkey McBean comes to town and shakes everything up with his very peculiar machine that gives the plain bellied sneetches, gasp, stars on thars!!! Chaos and confusion ensue and soon nobody can tell who is who. Arbitrary and constructed criteria? Yes! But, that is the point is it not? And though those of us at the Book Jam have not yet read it, for those of you needing a more serious take on Dr. Seuss, we note Theodor Seuss Geisel(2010) a biography of Dr. Seuss written by Dartmouth professor Donald Pease.